The elaborate entrance to the Monte Carlo Resort Hotel and Casino in Las Vegas, Nevada, USA. A hotel designed and modeled in true Monte Carlo style is the Monte Carlo Resort Hotel and Casino situated along the Vegas Strip in the bszzing city of Las Vegas, Nevada, USA. An outstanding resort which offers visitors an array of amenities including a spa, fitness studio, swimming pool, shoppin and much more. The Monte Carlo Resort Hotel and Casino also has a great line up of entertainment and headliners. 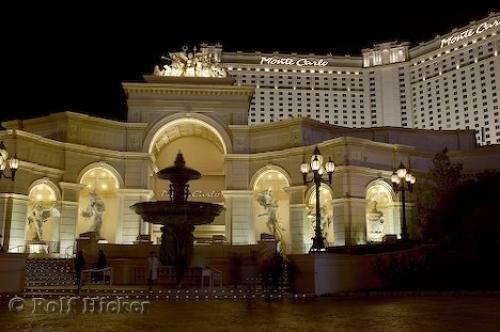 Photo of the Monte Carlo Resort and Casino along the Strip of Las Vegas, Nevada, USA.